Greetings, friends! 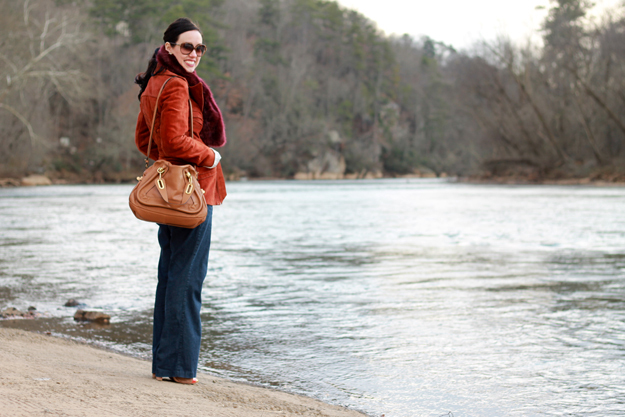 I haven't worn this vintage suede jacket in quite a while, so I'm happy to pull it out and showcase it on this blog. I purchased it in the fall of 2011 for rather cheap (I can't remember exactly, but I think it was under $40). I love classic thrift finds like this. Thanks for stopping by today and have a fabulous weekend. cute! love the color combo here! Beautiful tone of red and I love those shoes!! That jacket is just beautiful! The colour is so unique and pretty...love it! LOVE that coat and that faux fur scarf. This suede and fur combination is so glamorous! And I love that bag. Great shoot, LOVE your shoes! I want that fur scarf! It's so fun :) Great look! Such a gorgeous color combination! The fur scarf is such a great piece that just takes the outfit to a whole nother awesome level!